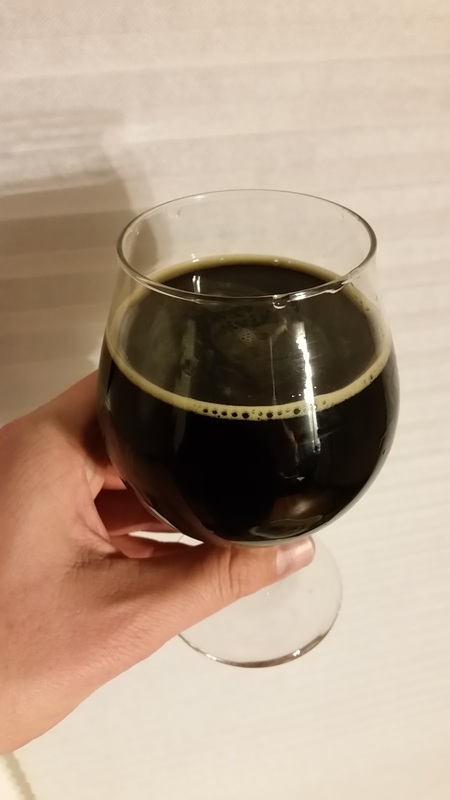 More than two months after brewing and about 5 weeks after kegging, I wanted to do a taste-test of my imperial stout. This tasting was done prior to our club competition, so as to not bias my opinion on it one way or another. In the competition itself, it was at the top for the homebrewed entries, although just barely! A two year old entry from another club member was just behind mine in the overall scoring. Original gravity = 1.098; final gravity = 1.031; abv = 9.1%; estimated IBU = 66.5. Aroma is rich and moderately roasty, with a faint earthy note and a very slight alcohol tinge in the background. As the beer warms up, the booziness comes a little more to the forefront, but is not overwhelming. The aroma is rich enough that it blows out the smell receptors pretty quickly. I don’t pick up any level of fruitiness. This beer is black, or a rich chocolate brown when viewed at an angle. The head is low, thin, and brown, which rapidly subsides to a ring around the edge of the glass. This bit of head is pretty persistent, though. Flavor-wise, this beer has a prominent malt character that is distinctly roasty (coffee-like) and a tad burnt on the finish. As the beer warms up, I get some chocolate notes, too. There is a tinge of alcohol heat, but that is definitely in the background. This is balanced against a hefty dose of bitterness. This beer has really great body, and a slightly creamy feel on the tongue. The finish is medium-dry, with a lingering roasty finish. It has maybe a touch more bitterness on the extended finish than I care for, but this is fairly minor in the overall beer. Carbonation is moderate and seems appropriate for the style. This beer turned out pretty well, particularly for a “big” style that I haven’t attempted previously. For what it is (imperial stout), it’s a pretty good beer. I’m missing out on a bit of the malt complexity in the flavor (I think), but that also could be my unrefined palate. Attenuation seems spot on–I was worried this might have underattenuated or ended up a bit cloying, but that is definitely not the case. So would I brew this again? Sure, I think it’s a pretty good recipe, although not so exceptional that I wouldn’t try others, too. I’ll be curious to see how that assessment changes as the beer ages. I also should say I don’t see myself making imperial stouts that often–I just don’t care for “big” beers, and it’s a lot of effort for a beer that I’m only moderately interested in (even if I think it tastes pretty decent). This entry was posted in imperial stout, stout and tagged Red Star Imperial Stout. Bookmark the permalink.